Description. 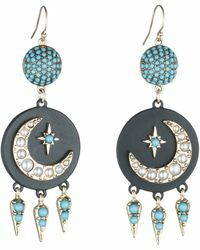 The tribute post drop earring features a pave of pearl cabochons on star and full moon motifs in homage to the victorian symbols that honour feminine spirituality and guiding light. Exquisite pearl cabochons balance starry blackened brass beads. Materials. Gold tone plated brass, blackened brass, glass pearls. Measurements. 2 1/2" x 5/8" at widest.